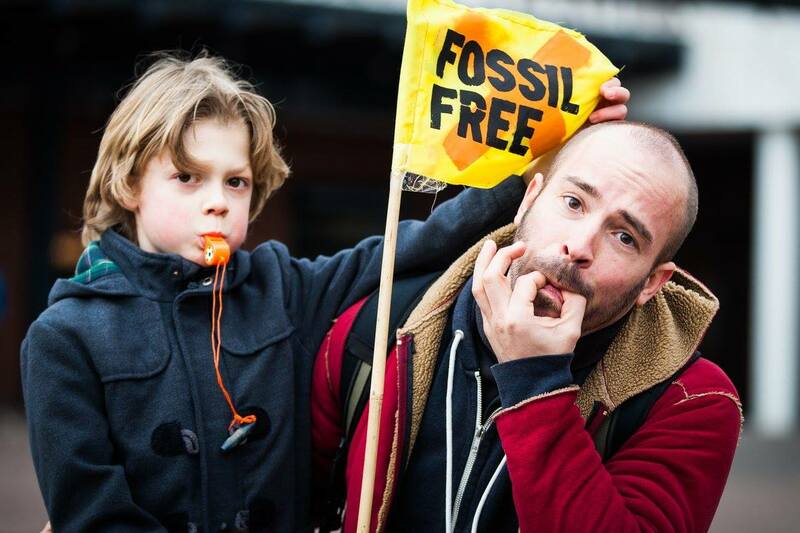 On 13 and 14 February 2015, representatives from 450 cities in 60 countries marched, sang, danced, cycled and otherwise celebrated Global Divestment Day, making a public statement to encourage or proclaim to divest from fossil fuels. 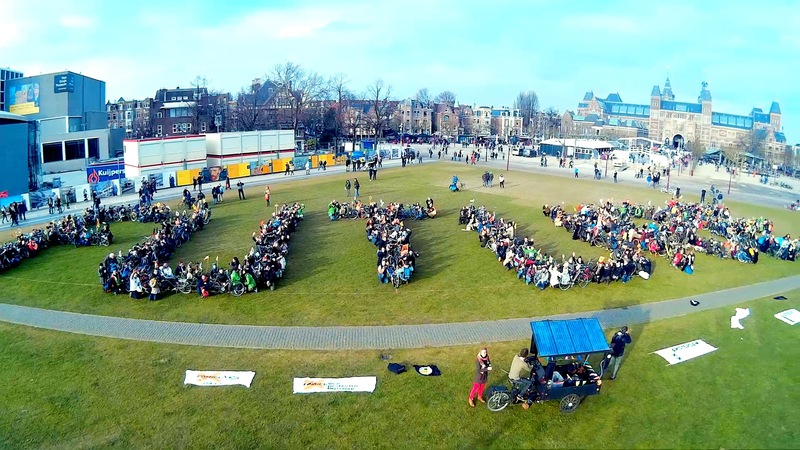 Amsterdam was one of those cities, showing off a little planetary love at this Valentines Day event. What is divestment? The opposite of investment: to divest stocks, bonds or other funds from controversial sources (such as fossil fuels) and to reinvest these funds in sustainable sources (such as renewable energy). 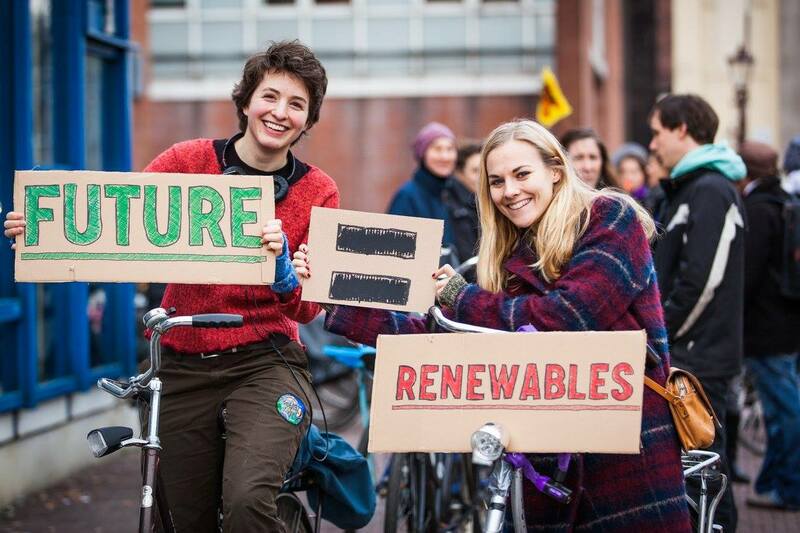 The Fossil Free Divest Movement initiated in 2011 first on US college campuses when students lobbied their boards to divest university funds from fossil fuels and reinvest them in renewables, as a way to tackle climate change head on. It has since expanded, with more than 50 billion US dollars divested from fossil fuels, according to the US Fossil Free campaign. 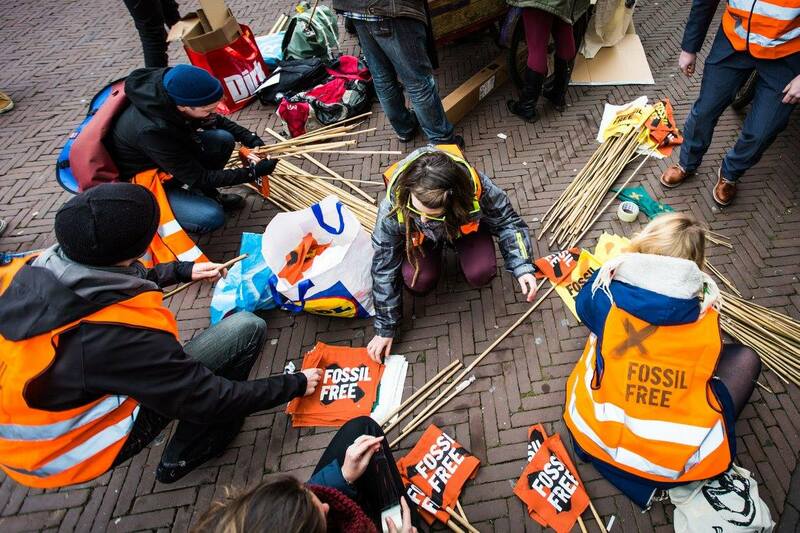 The Divest Movement has expanded from college campuses and boardrooms, to the city streets. Citizens from cities such as Belgrade, Berlin, Boston, Copenhagen, Edinburgh, Ho Chi Minh, Johannesburg, Manila, Seattle, Stockholm, St. Petersburg, Sydney and more (see photos) marched, shouted, danced and joined together, bringing this message forward. Building on the momentum of recent climate change marches and events, such as September’s Peoples Climate March with 2646 global actions, citizens gathered once again. This time with a targeted message: to encourage their universities, their cities, their employers, and their associations, to divest. 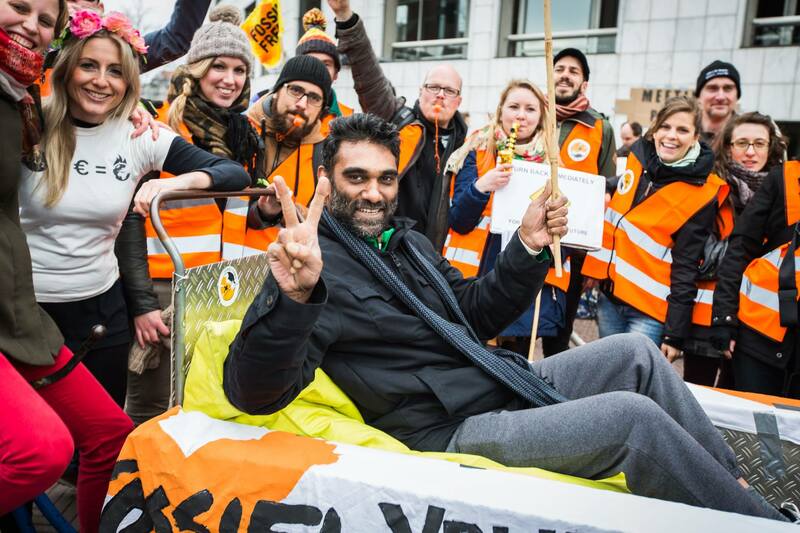 Fossielvrij NL organized the march in Amsterdam and in several Dutch cities. 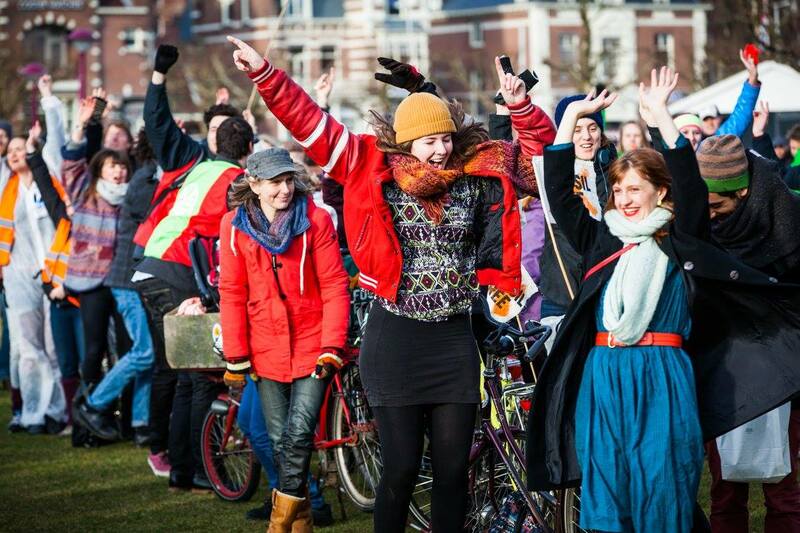 But as you do in Amsterdam, instead of marching, we cycled. 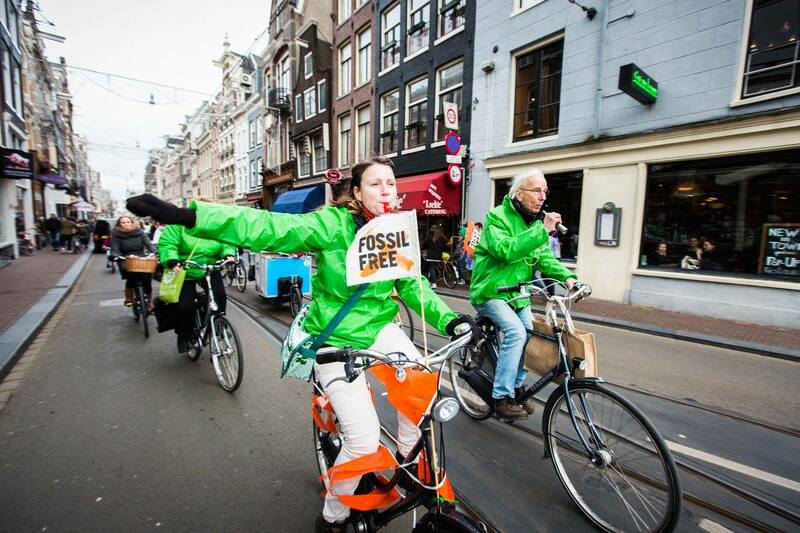 Bicycles were colorfully costumed, marked with signs stating “Fossil Free” or “renewables” or similar messages. 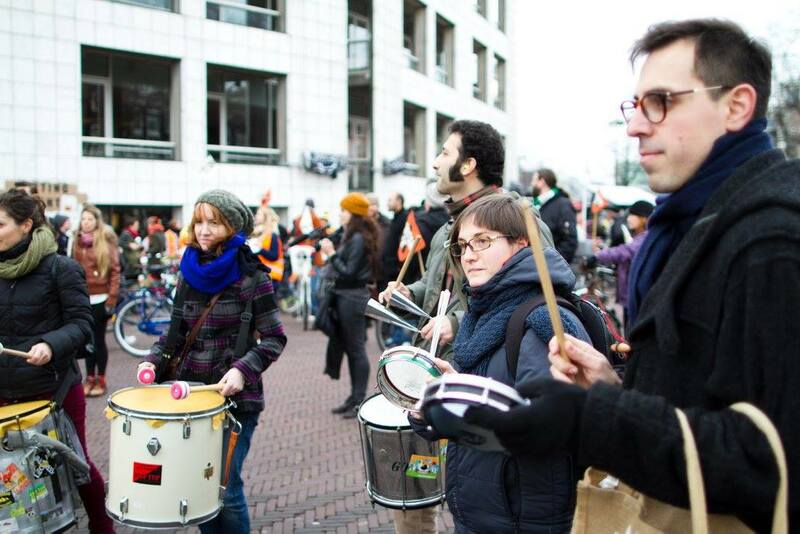 The bicycle brigade assembled first at Amsterdam City Hall, bringing horns, drums, whistles and kitchen pots and pans. 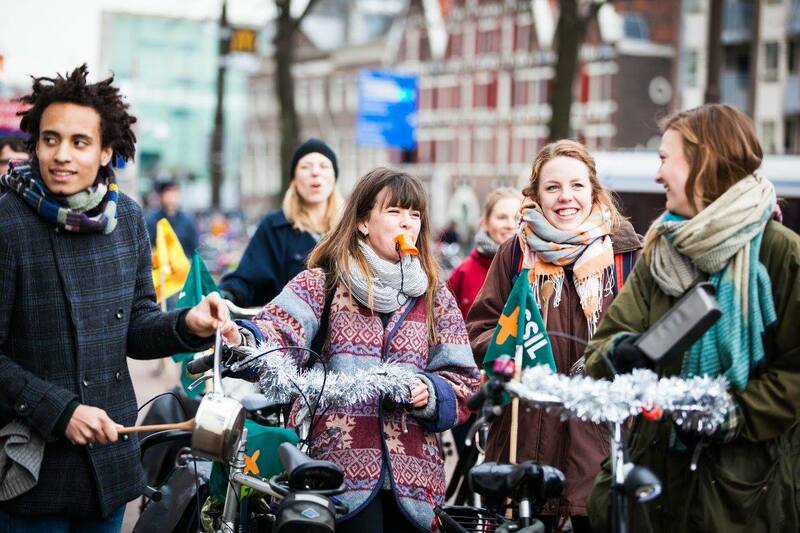 This – together with hundreds of bicycle bells – were sounded in chorus to encourage the City of Amsterdam and other partners to divest from fossil fuels. 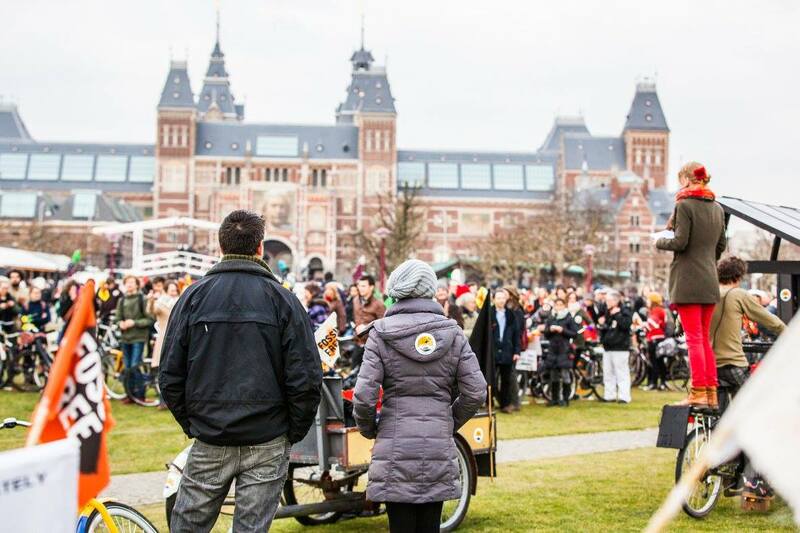 Amsterdam is a city well known for its cycling culture and its general promotion of sustainable urban living. The Atlantic just posted an article on this: Amsterdam has officially run out of cycle parking. Indeed, the city’s cycling culture is its pride, its charm – and a common topic for my blogging pleasure. Still, behind this green image is a smoky gray secret. Amsterdam Municipality is part owner of a 650 MW coal-fired power plant, operated by the energy company NUON. Amsterdam is also home to the largest gasoline port in the world, and the second largest coal harbor of Europe. This cycle city is heavily entrenched in the fossil fuels business… Amsterdam is both green city and gray city simultaneously. 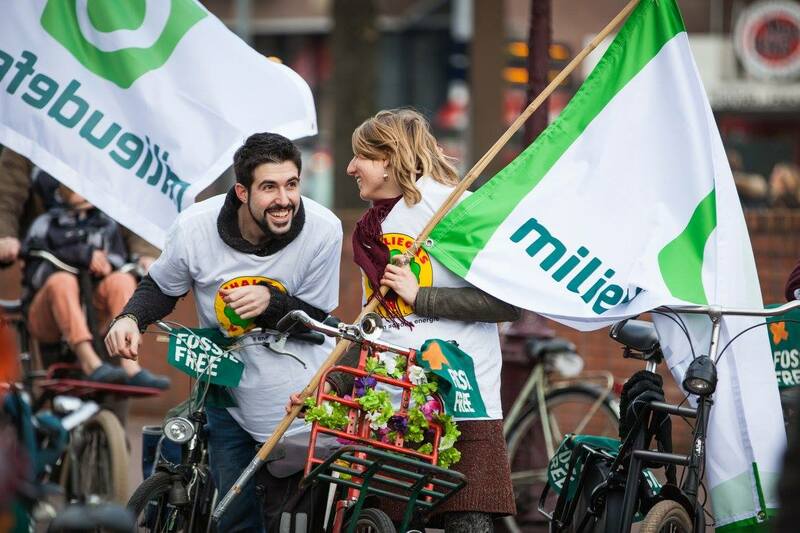 Case in point: while the city’s cycling infrastructure continues to improve, and more tomatoes and strawberries are planted on its rooftops and public gardens, the municipal council recently voted to invest circa 100 million Euros to expand the capacity of coal and gasoline shipping in its harbor. 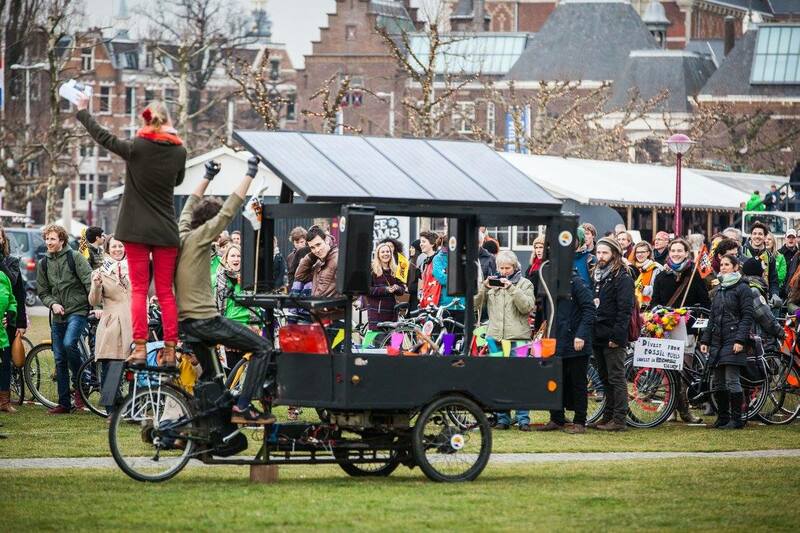 Hop on that bike and DIVEST! 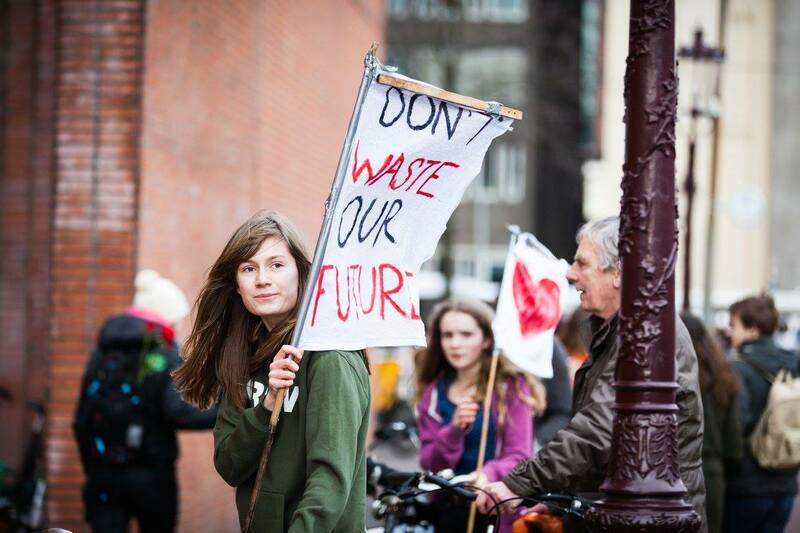 **Most photos in this blog post: Nichon Glerum www.nichon.nl (Global Divestment Day Amsterdam). 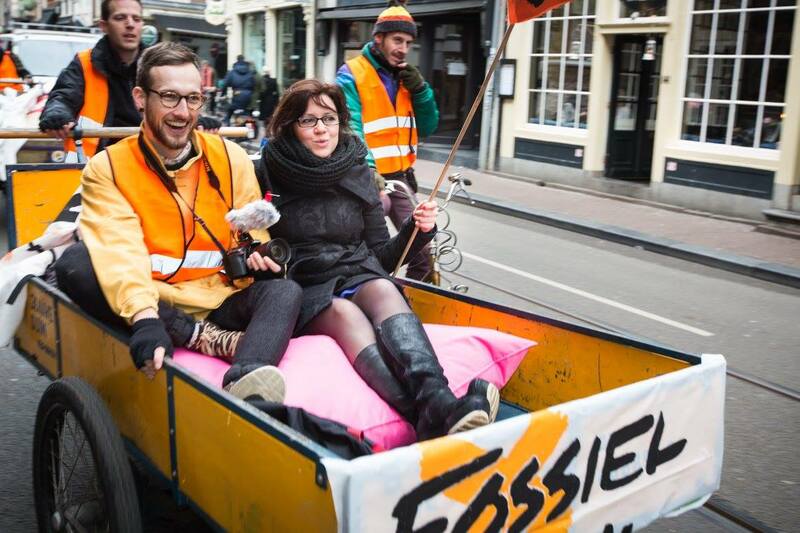 Other photos and the video link were taken with permission from the Fossielvrij NL Facebook page.